Place your pork shoulder roast and quartered onion in a roasting pan. Cover and bake at 325 for several hours until done. Remove from oven, let cool. Using two forks, shred the meat. Melt the butter in a saucepan. Cook the onion and garlic until soft. Add 2 cups of water and the rest of the ingredients. Stir until well mixed. Place over medium-low heat and simmer 30 minutes. Pour BBQ sauce over the pulled pork. Serve on sandwich rolls or buns. 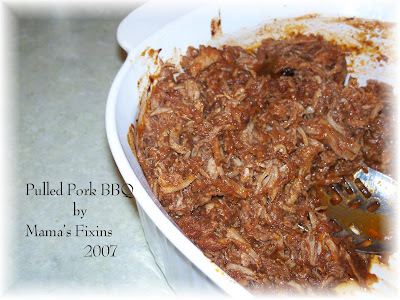 This BBQ sauce recipe is also good on pulled beef or chicken! YUM, there's drool running down my chin! The potatoes sound YUMMY too! OH my goodness! I can not wait to try it! I found your blog from Leigh Ann's blog (Momma Roars). I am looking forward to checking your blog regularly. I love to cook, bake and I am always looking for new recipes, etc. Thanks for sharing. Yum! This week I did something similar with a beef roast. Sooo tasty. I am hoping to get around to cooking my roast up this way tomorrow - if I manage to get my day off from work still! :) I will let you know how it turns out! !